Recreating a spa experience at home is truly blissful. 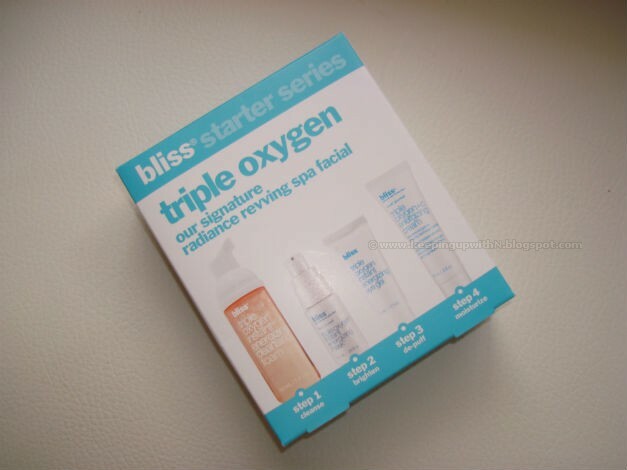 And if there's one beauty product you buy this month, let it be the Bliss Triple Oxygen Starter Kit. If you asked me to describe the kit in two words, I'd say: guaranteed radiance. The kit consists of 4 products that helps you emulate Bliss's spa process at home. In other words, it's a facial that delivers a radiant finish. To pamper my skin, I use all 4 products (as it would be done in a spa); for an everyday treat I select about two of them. While all 4 products are great, there is one that I absolutely love! Read on and you will discover why. 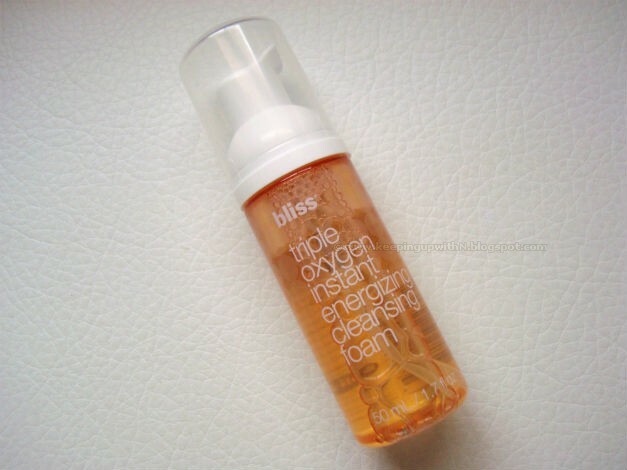 The Triple Oxygen Instant Energizing Foam is a light-weight cleanser that surprised me. The bottle consists of a cleansing liquid but when you pump it out, you get foam directly. Yep- foam! It's a liquid-to-foam cleanser that has a wonderful fragrance and three pumps helps you get rid of the day's make-up. It also hydrates the skin (bonus!). I usually use a BB cream every now and then however, I noticed that I had to use this cleanser twice in order to remove all traces of foundation. This next product is the star of the kit and it is my absolute favorite! The Triple Oxygen Instant Energizing Mask should have been named the Super Instant Illuminating Mask. I don't know why Bliss named it otherwise. It is magical. From all the masks that claim instant illumination, this one delivers what it claims every single time I use it. The mask is infused with rice bran extract, Vitamin C and anti-oxidants, among other things to deliver smooth and brighter looking skin. The consistency is that of a light-to-medium orange colored gel that has a citrus fragrance. You massage it on damp skin and the gel turns to foam in a few minutes. The first time I got it wrong- the moment the foam appeared, I washed it off thinking the job was done. The second time, however I waited for the foam to settle and spent the next few minutes reading what was mentioned on the bottle. And it was during that time I felt the mask come in full effect- I could feel little bubbles popping on my skin. Once the mask was washed off, it was a strange moment. My face looked brighter so I scurried to my room thinking it had something to do with the lighting in the bathroom but I witnessed the same outcome. I kept thinking if it was due to the additional bottles of water I was consumed throughout the week. Two days later, I used the mask again, and saw the same result- a brighter complexion. A quick read on Bliss's website confirmed my thoughts- the mask has illuminating properties, y'all! I was ecstatic- when was the last time you tried on a quick fix and ended up with bright skin immediately? I wasn't expecting this particular result at all. This is the first mask I have tried that gives you a visibly brighter complexion in the first go! I told you it was magical. Usually, when I use face masks I make it a point to do this. However, this mask works on it's own. You must try this. This is the BEST brightening face mask. I'm always on the look-out for eye-creams that hydrate the eye area. 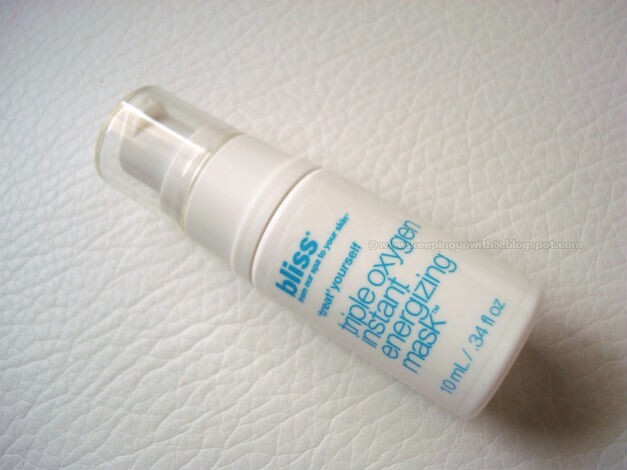 I apply the Triple Oxygen Instant Energizing Eye Gel in tapping motions on the contours of my eyes and not directly underneath the eye area- here's why. When applied in the morning, the transparent gel de-puffs and cools the under eye area. I like to use this just before I go to bed primarily because of its cooling effects and vitamin C.
The final product, the Triple Oxygen+C Energizing Cream is a moisturizer laden with oxygen and vitamin C.
It has a wonderful fragrance (a little on the citrus side of things) and the consistency is that of a light-weight gel. 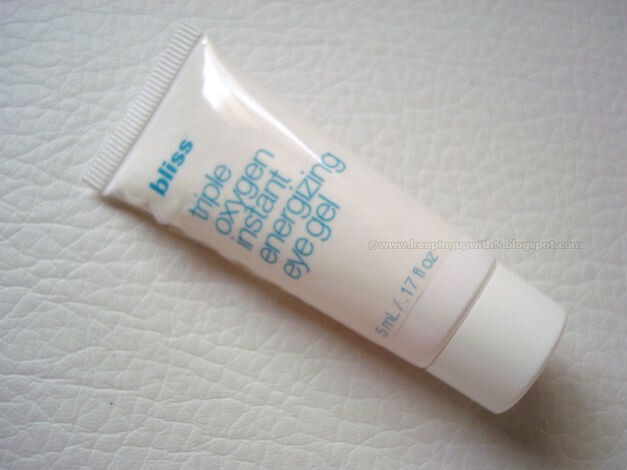 It not only aids in hydration, but also lends a subtle dewy finish (I love it!). The cream states that apart from releasing oxygen into the skin, it helps promote collagen synthesis. 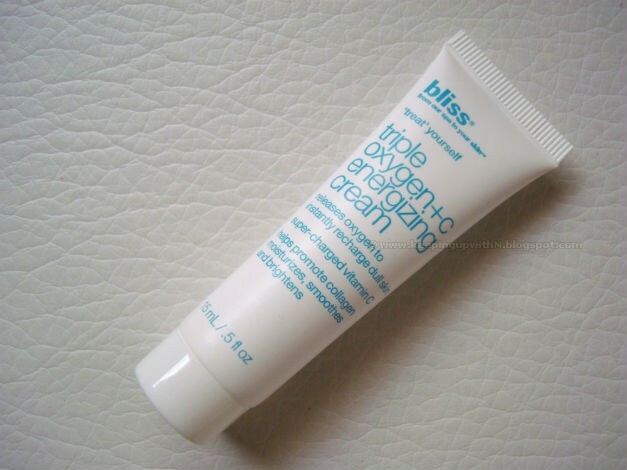 This moisturizer also happens to be Bliss's best-seller! If you are planning to try out Bliss, I suggest you go for this kit as it is ideal to test different products. 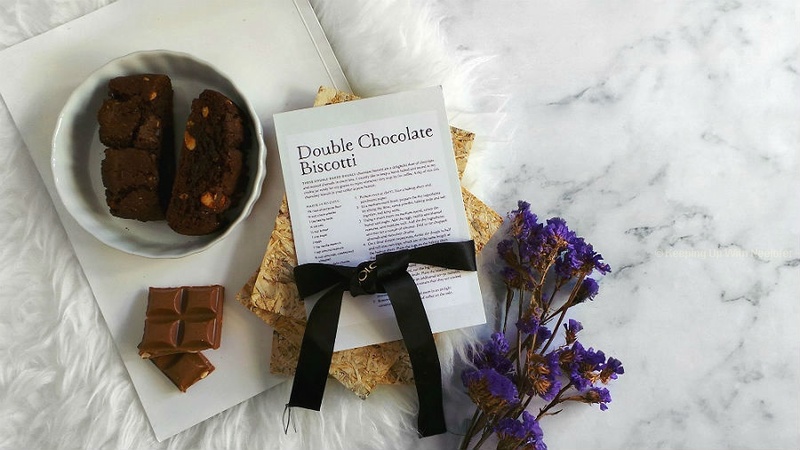 Then when you find your favorite, you can either purchase the individual product or buy the kit again. I for one, am definitely getting the Energizing Mask as soon as I run out of it. This kit also makes a great side gift for Eid especially for those who are just starting their skincare routine or those who are looking for a change in their skincare products. 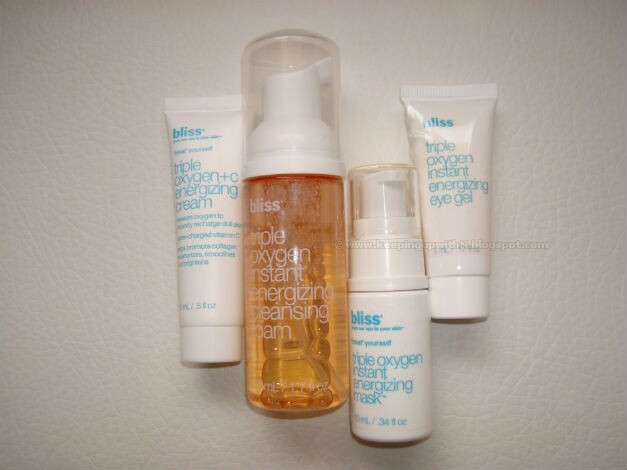 Have you tried any of Bliss's products? Do you have a favorite? Tell me all about it. Bliss is sold in Debenhams across the UAE.